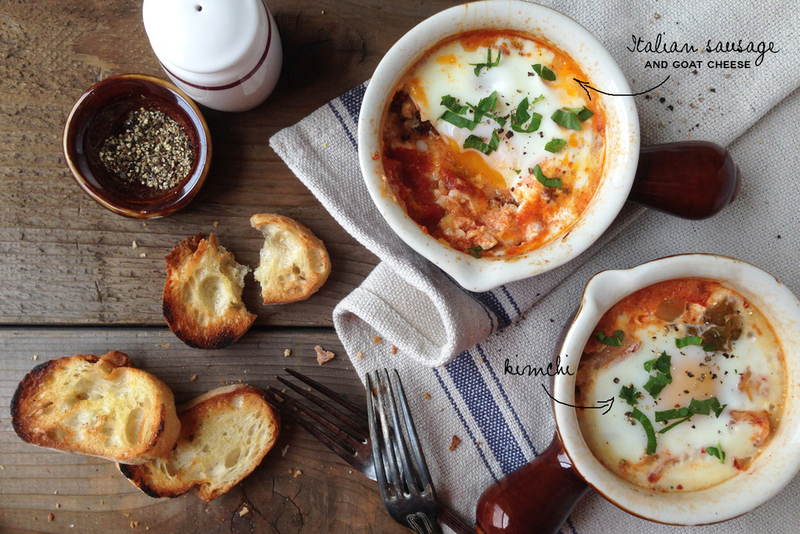 On a recent trip to NYC I had this yummy appetizer of baked eggs in a tomato-peppery sauce with spicy kimchi. It was so delicious and reminded me of a Bulgarian favorite dish called giuvedje, which is a baked egg in tomato sauce and feta cheese (and sometimes spicy salami). In Bulgarian giuvedje (let’s be fair, I am not expecting you to pronounce that) refers to the dish in which the meal is prepared. It is a small clay pot with a lid which allows the goodies inside to simmer, cook faster and retain the juices. It makes a hearty lunch or an appetizer. Back to Minnesota, inspired and with a suitcase stuffed with baking dishes from a lovely store in NYC, I was all ready to bake this favorite meal. I couldn’t find dishes with lids, but the ones I got worked pretty well with some foil on the top. So, may I present to you baked eggs done in two ways - one with roasted peppers and kimchi (for all of you adventurous vegetarians) and the other one with roasted peppers, mild fresh Italian sausage and goat cheese. Feel free to mix, add, subtract and make these as yummy as you wish, just remember that the tomato sauce and the eggs are the important ingredients. Preheat the oven to 400 degrees F. Meanwhile, heat the oil over medium-high in a medium-sized saucepan. Add the onion and sauté until soft for about 5 minutes. Set aside. Remove the casing from the sausage, tear the meat into 1/2 inch chunks and sauté in a non-stick pan with a splash of oil until fully cooked (about 2 minutes). Place on a plate and set aside. Mix the crushed tomatoes, chopped peppers and sautéed onions in a bowl, and add salt and pepper to taste. Divide the mixture among 4 oiled 10-oz. bowls/ramekins. Top 2 of the ramekins with the kimchi and the remaining 2 with the sausage. Cover each ramekin with foil, make a small slit on top of each foil (to allow steam to escape), place the ramekins on a baking tray, and bake for 15-20 minutes (until fragrant and bubbly). Carefully remove the tray with the ramekins, top the 2 sausage ones with the remaining goat cheese and crack an egg on each dish. Place the foil back on the dishes (creating a slight dome with the foil so the eggs don’t stick to it). Turn the oven off and return the ramekins back to the oven. Leave them in the hot oven for 10 more minutes. Top with chopped parsley and black pepper, and enjoy with crusty bread or toast.